Spinach is harvested in Georgia between November and May. Baby spinach is harvested earlier than regular spinach, so the leaves are smaller and more tender, but the nutritional value is the same. Raw baby spinach has no fat or calories, and is high in vitamins A and K as well as folate. This colorful, Italian-style soup is as delicious as it looks. Add onions, carrots and celery. Cook for five minutes, stirring occasionally. Add vegetable stock and beans. Bring to a boil. Add zucchini and return to a boil. Simmer on low for 10 minutes. Add pasta and cook for eight minutes, or until pasta is tender. Add spinach and peas and return to a boil. Serve warm. Posted in Recipes. 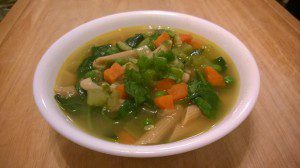 This entry was tagged diet, health, healthy, heart health, nutrition, recipe, recipes, soup, spinach. Bookmark the permalink.